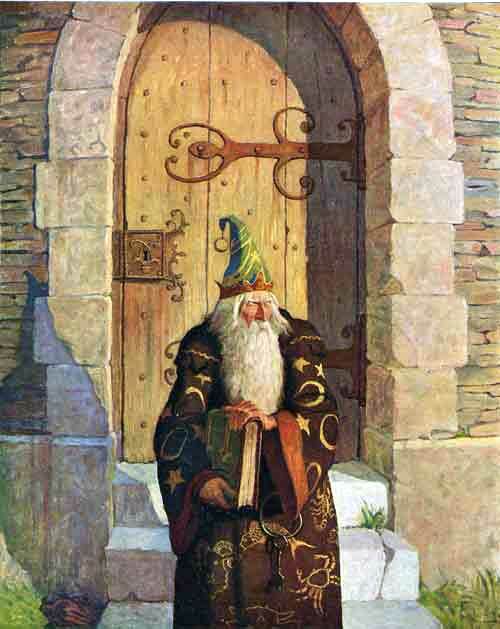 Newell Convers Wyeth was born on October 22, 1882, in Needham, Massachusetts. Growing up on a farm, he developed a deep love of nature. His mother, the daughter of Swiss immigrants, encouraged his early artistic inclinations in the face of opposition from his father, a descendant of the first Wyeth to arrive in the New World in the mid-17th century. His father encouraged a more practical use of his talents, and young Convers attended Mechanic Arts High School in Boston through May 1899, concentrating on drafting. With his mother’s support he transferred to Massachusetts Normal Art School and there instructor Richard Andrew urged him toward illustration. He studied with Eric Pape and Charles W. Reed and then painted with George L. Noyes in Annisquam, Massachusetts, during the summer of 1901. On the advice of two friends, artists Clifford Ashley and Henry Peck, Wyeth decided to travel to Wilmington, Delaware, in October 1902, to join the Howard Pyle School of Art. 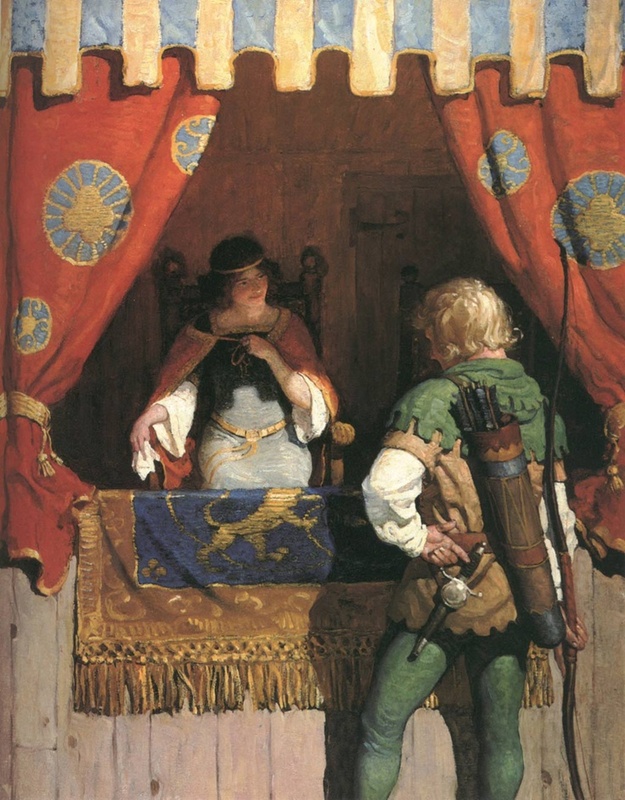 Howard Pyle, one of the country’s most renowned illustrators, left a teaching position at Drexel Institute of Art, Science and Industry in Philadelphia to open his own school of illustration in Wilmington. Pyle was an inspired teacher and Wyeth an attentive pupil. The master emphasized the use of dramatic effects in painting and the importance of sound, personal knowledge of one’s subject, teachings Wyeth quickly assimilated and employed throughout his career. The astute young man recognized the value of Pyle’s instruction, writing to his mother just after his arrival, “the composition lecture…opened my eyes more than any talk I ever heard.” (BJW, p. 21) In less than five months, Wyeth successfully submitted a cover illustration to the Saturday Evening Post. Following Pyle’s maxim to paint only from experience, Wyeth made three trips between 1904 and 1906 to the American West. He spent much of these trips simply absorbing the Western experience which allowed him to paint images that would place him among the top illustrators of his day. 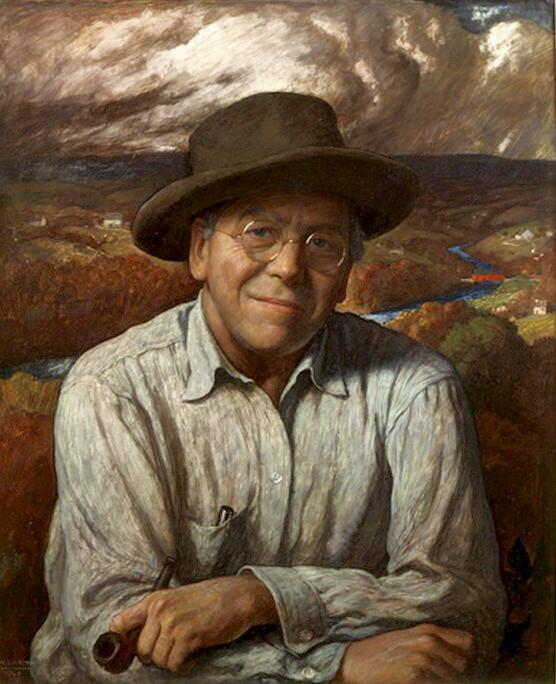 By 1907, Wyeth was heralded in Outing Magazine as “one of our greatest, if not our greatest, painter of American outdoor life.” His pictures had appeared in many of the most popular magazines of the period, such as Century, Harper’s Monthly, Ladies’ Home Journal, McClure’s, Outing, and Scribner’s. 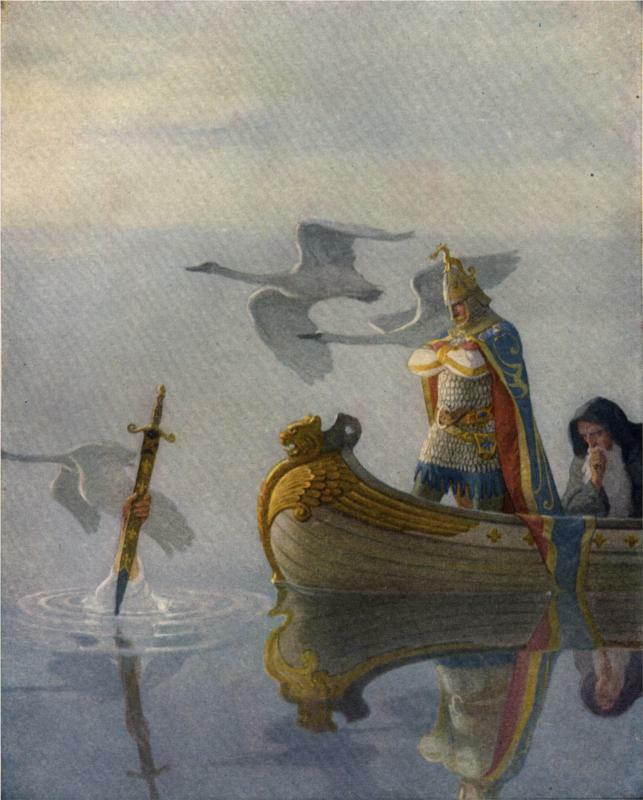 “When Sir Percival came at night unto the brim.” Art by N.C. Wyeth from The Boy’s King Arthur, 1919. 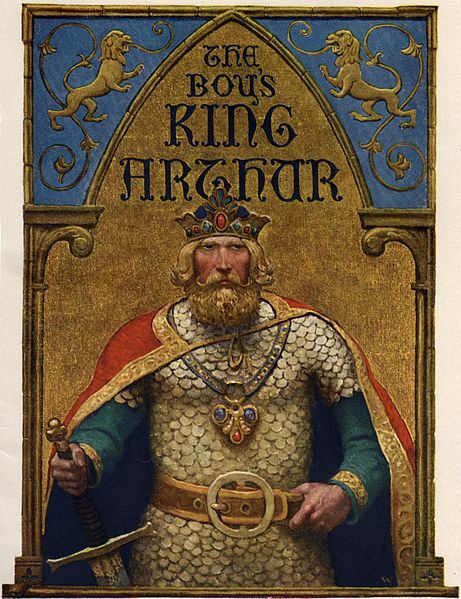 First published in 1880, The Boy’s King Arthur was edited by the American poet Sidney Lanier from Thomas Malory’s history of King Arthur and the Knights of the Round Table. 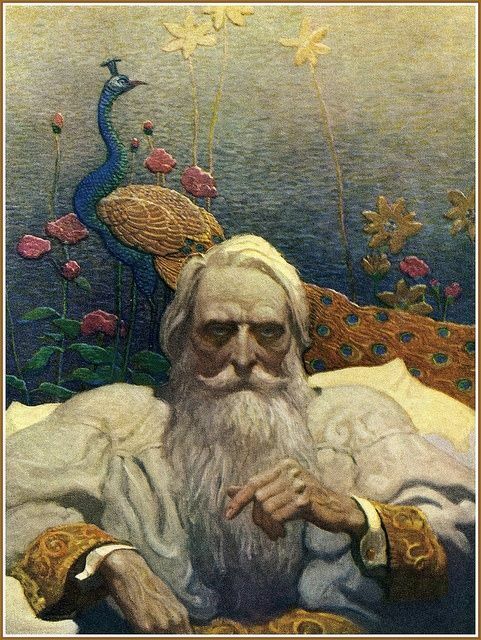 Lanier said of the Malory work, “I suspect there are few books in our language which lead a reader — whether young or old — on from one paragraph to another with such strong and yet quiet seduction as this.” The Lanier text, slightly abridged, was enhanced in 1917 by the superb illustrations of N.C. Wyeth, whose magnificent pictures capture the drama and romance inherent in the tales of Arthur, Launcelot, Tristram, Gareth and Linet, Galahad and Percival. In 1906 Wyeth married Carolyn Brenneman Bockius of Wilmington. The couple lived for a short time in the city, but moved in 1908 to Chadds Ford, Pennsylvania, 10 miles north of Wilmington along the Brandywine Creek. Chadds Ford had been the site of Pyle’s summer school, and the rolling hills and sycamore trees of the Brandywine Valley had already exerted a profound influence on Wyeth, subduing his enthusiasm for the rough and tumble west. In 1911, the Wyeths purchased 18 acres of property in Chadds Ford, not far from a Revolutionary War battlefield. The proximity appealed to the artist’s abiding love of history. Immediately the Wyeths set about to build a house and studio. They would raise five talented children on this property and the valley landscape would become almost sacred to the displaced New Englander. In 1911, the publishing house of Charles Scribner’s Sons engaged Wyeth to illustrate Robert Louis Stevenson’s Treasure Island, his first commission in Scribner’s popular series of classic stories. The 17 paintings that make up the set are masterpieces of American illustration. Their size and scale, unusual in illustrations of the period, give the paintings a heroic quality that is apparent even in the greatly reduced reproductions. Within the set of illustrations, Wyeth brilliantly mixed subject matter. Action and character study are united in each painting to further the narrative beyond the text. In every canvas, Wyeth’s superb sense of color and his ability to mix painterly passages with authentic detail prove him a master of the art. Complex compositions and his skillful use of intense light contrasted with deep shadow contribute to a palpable dramatic tension inherent in the paintings and not dependent on the text. 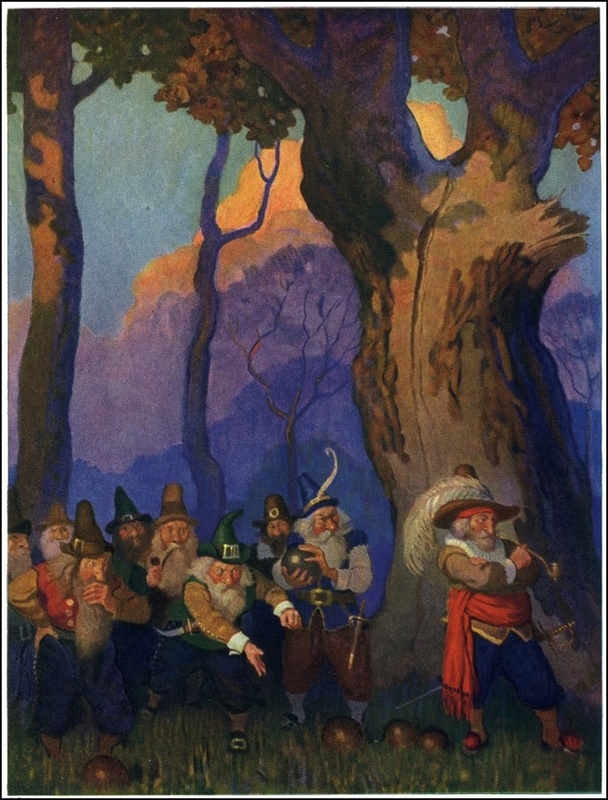 These pictures made the Wyeth-illustrated edition of Treasure Island a favorite of generations of readers. 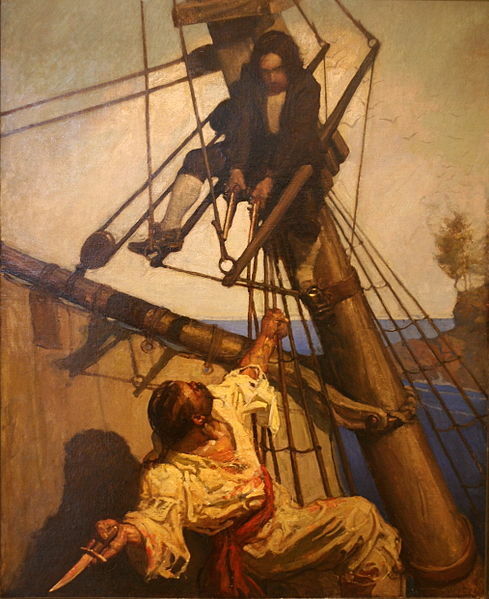 “One more step, Mr. Hands,” said I, “and I’ll blow your brains out!” Illustration by N.C. Wyeth for the 1911 edition of Robert Louis Stevenson’s Treasure Island. The success of Treasure Island insured Wyeth a long career with Scribner’s, illustrating in succeeding years many classic stories. 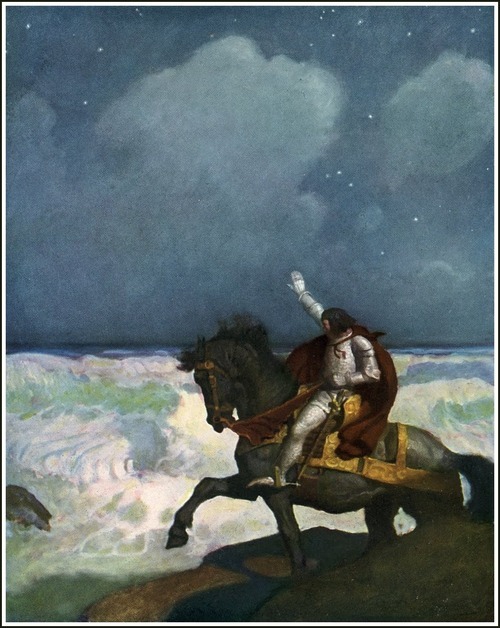 Among the most famous titles are Kidnapped (1913), The Black Arrow (1916), The Boy’s King Arthur (1917), The Mysterious Island (1918), The Last of the Mohicans (1919), The Deerslayer (1925), and The Yearling (1939). 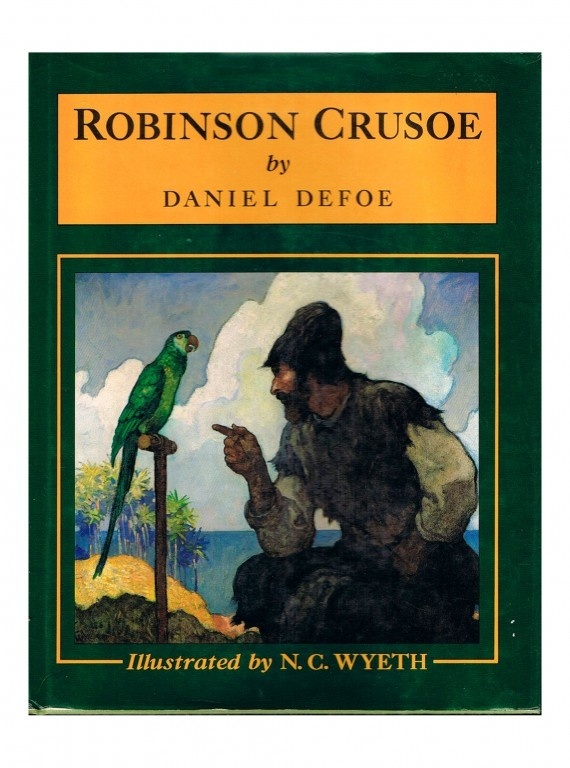 He also created illustrations for other publishers, for books such as Robin Hood (Philadelphia: David McKay, 1917); Robinson Crusoe (New York: Cosmopolitan, 1920); Rip Van Winkle (Philadelphia: David McKay, 1921); Men of Concord (Boston: Houghton-Mifflin, 1936); and Trending Into Maine (Boston: Little, Brown, 1938). Despite his fame as an illustrator, Wyeth yearned to be known as a painter. The distinction between painting and illustration was an important one, with illustration carrying a pejorative connotation that Wyeth felt keenly all his life. Even though the commissioned work earned him income to support his family, he tried to escape the confines of textual limitations with personal paintings that included landscapes, still lifes, and portraits. From lyrical landscapes in an Impressionist style to powerful portraits of fishermen that recall the work of the American Regionalist artists, Wyeth experimented throughout his career with a wide variety of subjects and styles. However, he never did attain the personal satisfaction or public recognition that he sought. Wyeth also enjoyed a national reputation as a muralist. His earliest mural commissions (Hotel Utica, Utica, New York, 1911, and Traymore Hotel, Atlantic City, New Jersey, 1915) have been destroyed. In 1920 he created two Civil War battle scenes for the Missouri State Capitol (Jefferson City), the first in a long line of commissions he undertook in the 1920s and 1930s. Among them are murals for the Federal Reserve Bank, Boston; Westtown School, Westtown, Pennsylvania; First National Bank of Boston; Hotel Roosevelt and Fanklin Savings Bank, both in New York City; Hubbard Hall, National Geographic Society, Washington, D.C.; First Mechanics National Bank, Trenton, New Jersey; and Wilmington Savings Fund Society, Wilmington, Delaware. Many of these murals depict historical events, others such as The Giant for Westtown School and The Apotheosis of the Family have allegorical themes. In 1940 Wyeth accepted a commission from the Metropolitan Life Insurance Company, New York City, for an ambitious scheme illustrating Pilgrim life. The second phase of this cycle was incomplete at his death and finished by his son Andrew and son-in-law John McCoy. Most of Wyeth’s murals have survived, but many are no longer at their original sites. 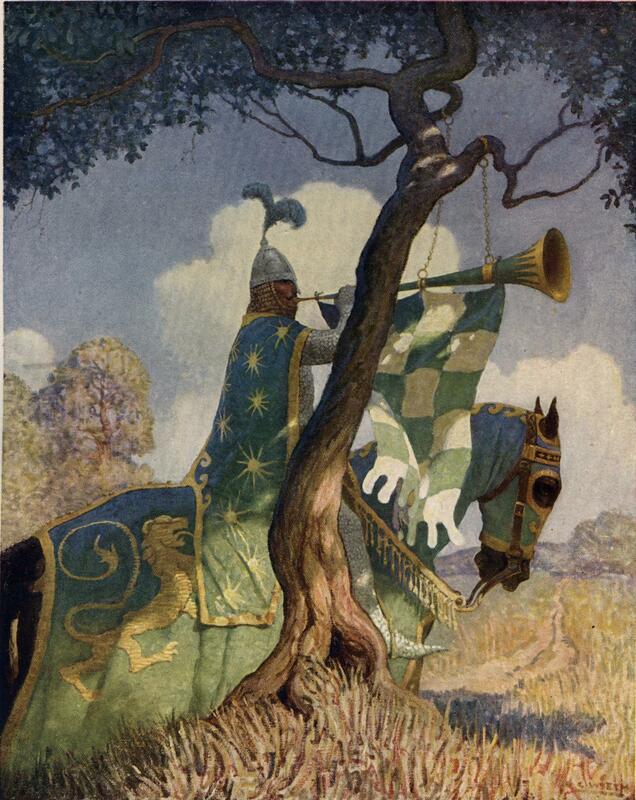 N. C. Wyeth – Robin Hood. One of America’s premier illustrators of the 20th Century, he was a wonderful artist. Father of artist Andrew, and grandfather of Jamie Wyeth. Throughout his career Wyeth created images for magazine advertisements and calendars. Several paintings commissioned by the Cream of Wheat Company in 1906-07 rank along with his best Western work. Later pictures advertised products of the American Tobacco Company, Aunt Jemima, Blue Buckle Overalls, Coca-Cola, General Electric, and Steinway & Sons, among others. For companies such as New York Life Insurance, Morrell & Company, and the Pennsylvania Railroad he produced calendar and poster images. During both World Wars, Wyeth contributed patriotic images to government and private agencies such as the American Red Cross. N. C. Wyeth died at a railroad crossing in Chadds Ford in 1945, when an oncoming train hit his car. He had lived long enough to see his children excel in talents he had nurtured-Nathaniel as an inventor; Henriette, Carolyn and Andrew as painters; and Ann as a musician and composer. Andrew Wyeth’s son James, also a painter, continues his grandfather’s legacy. The Brandywine River Museum, Chadds Ford, Pennsylvania, contains the largest collection of N.C. Wyeth’s artwork, and offers tours of his Chadds Ford home and studio. The museum, in conjunction with the Wyeth Foundation for American Art and Scala Publishers, Ltd., published N. C. Wyeth Catalogue, Raisonné of Paintings in 2008. Visitors to the Farnsworth Art Museum, Rockland, Maine, can see many of the paintings Wyeth did of the Maine coast, where he spent summers from 1920 to 1945. The Delaware Art Museum, the New York Public Library, and the Philadelphia Free Library hold significant collections of his paintings. 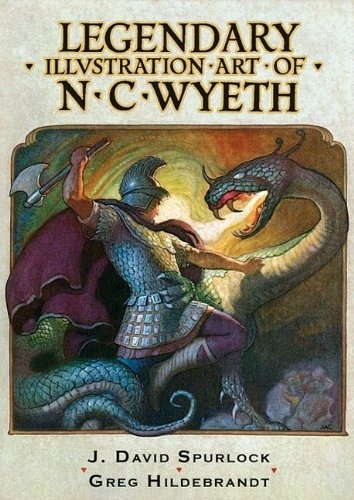 The Wyeths, The Letters of N. C. Wyeth, 1901-1945, edited by Betsy James Wyeth (Boston: Gambit, 1971: reprinted, Brandywine River Museum, 2008) is a collection of excerpts from Wyeth’s substantial correspondence. In N.C. Wyeth, A Biography (New York: Knopf, 1998), David Michaelis presents a thorough account of his life.